My boys, my world! : Gracie is 6 wks old! Gracie is 6 wks old! How adorable is my little niece? I couldn't resist taking some piccies of her the other day in the bath with the soap suds around her! I think she is about to graduate out of the laundry sink into the big bath now, she is getting too big. 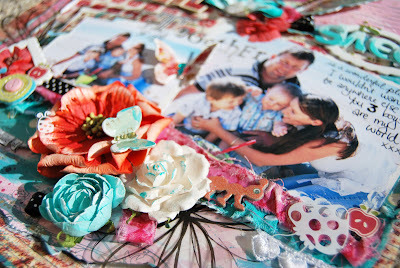 I scrapped some of these gorgeous family photos of us at the beach a couple of months back. I just love these 3 boys more than anything!! 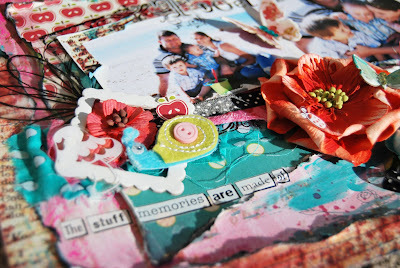 I used more RDG paper (loving that stuff) as well as a little bit of Prima (how unusal!!!) 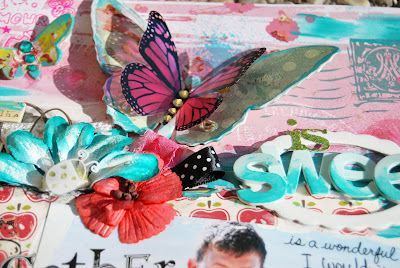 I am just adoring butterflies at the moment too! I think most of my layouts lately have one on there somewhere. Cooper started back at swimming today after a couple of weeks off and we now have our own pool clean and running properly again. He has been it everyday since it has been cleaned! He loves it and I think that is going to be my greatest battle this summer...... getting him out of the pool. With getting in our pool daily as well as his lesson he should be getting quite clever at it by the end of summer (not to mention extremely tanned)!!! Little Gracie is sooo adorable and thats a fantastic photo. Love the new LO.I think I need to try and use more pink. Looks amazing. Lovely family pics too. Yes I guess you could say Jedd is almost walking. He takes about 5 steps and then goes, I give up this is too slow. LOL. And I just love your layouts. I haven't done something like yours before,,,might have to give it a try. Where do you shop for suplies usually? also you have a nice little group of "followers"how did you do that? Its a free photo editing website. You can use more actions if you pay, but I use the free ones. MATTE for the white frame. and CROSS PROCESS first for the MATTE frame, but you dont have to. Then when your happy with it just select SAVE and it will save it straight to you comp. HTH. Let me know if I can help some more. What a stunning LO of you and your 'three' boys - beautiful as always.